NAB will be here before you know it. Our product team is whistling while they work, getting tech demos ready for new versions of Sapphire, Continuum, and Mocha. We can’t wait to show you what you can expect from us later in 2018! 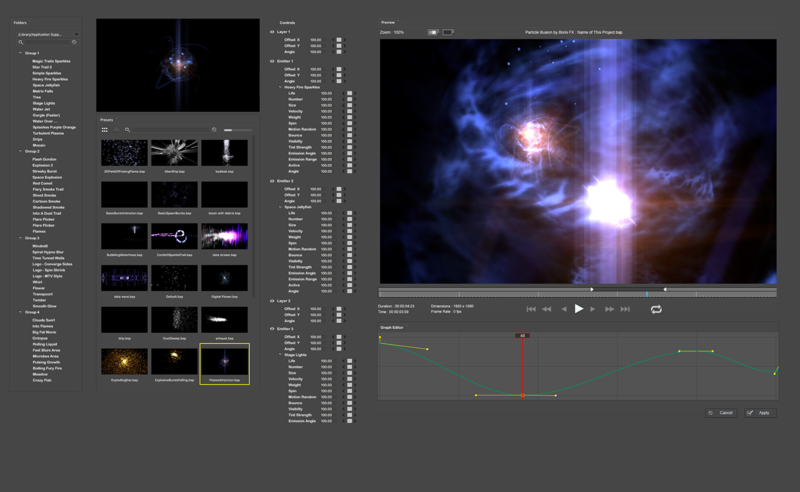 We’re rebooting the famed particle system from Alan Lorence and the former GenArts crew. Redesigned from the ground up, Particle Illusion will feature a lightning fast GPU-accelerated engine with a simple, easy-to-learn interface. You’ll be creating stunning motion graphics elements like sparkles, smoke, and fireworks in no time. Wouldn’t it be the awesome if all your favorite plug-ins — Sapphire, Continuum, and Mocha Pro — were available in one cost-effective suite on one convenient license? 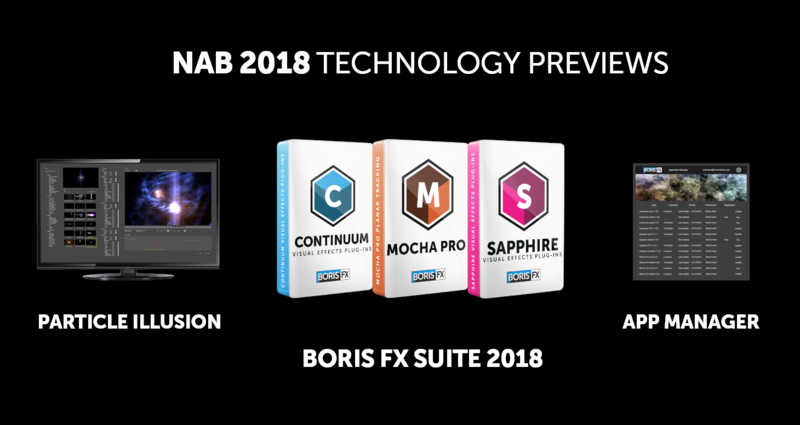 The new Boris FX Suite (which will take advantage of the new Boris FX App Manager, see below) will be available as a multi-host or choose from Adobe, Avid, and OFX options. Purchase a full license or annual subscription. We’re constantly looking for ways to improve your customer experience, which is why we’re creating the Boris FX App Manager. The new centralized utility will make installing and managing your licenses as easy as 1-2-3, making it simple to jump from workstation to workstation. 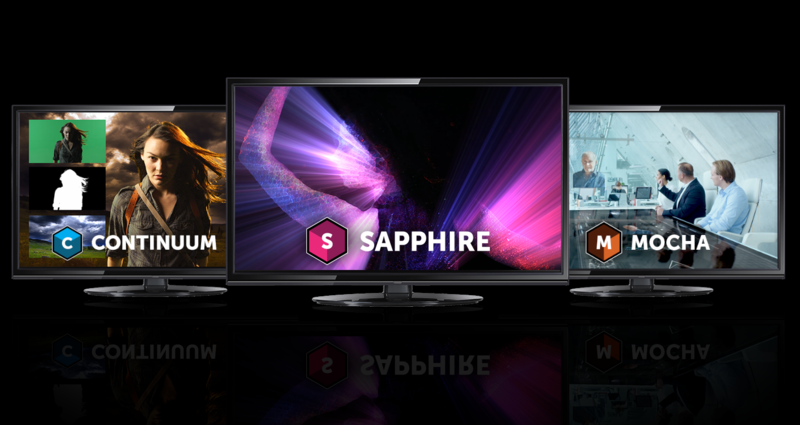 Make sure you stay on the most recent versions of Sapphire, Continuum, and Mocha Pro with the new low-cost Upgrade & Support Plan which includes automatic upgrades, full phone and email support, unlimited burn and render licenses, and more. Pricing varies by product ($195-$495). Learn more. We’ve got a packed line-up of special guest demo artists showing how they use Sapphire, Continuum, and Mocha in their projects. Artists include, Nick Harauz, Apple, Adobe and Avid certified instructor; Ben Brownlee, VFX artist and Curious Turtle trainer; Kelsey Brannan, YouTube influencer Premiere Gal; Alejandro Brubaker, motion graphics artist and adjunct professor; Ben Eshagpoor, VFX and Cinema 4D artist, BeMotion Design; and product managers and specialists from the Boris FX team.